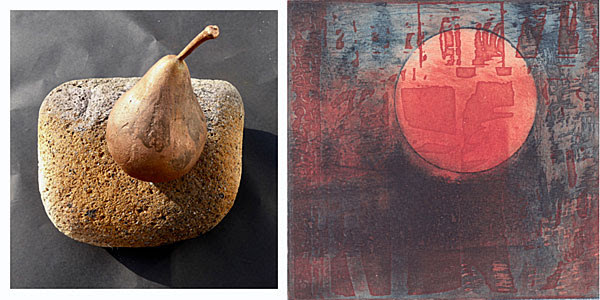 Don Braisby’s first solo exhibition with Editions is a collection of works that demonstrate the beauty of the process of corrosion, itself a part of the printmaking process. The plates and the prints are twin components of the outcome of that controlled creative process. The work is a record of my exploration of self and other, through journey and place. In my work, I’m drawn to exploring the area between conscious and unconscious, the borderland state of being between dream and waking. It is a place where images predominate. I live and am inspired by the landscape of the borderlands of North Wales and England. It is a land of myth and legend that bears the scars of the industrial revolution and changes in ownership and culture over the centuries. My most recent work plays with the reality of etching as the artistic control of corrosion. The plates are developed using both the natural corrosion created by weathering and that produced by electrolysis and electro chemical processes in the studio. The finished work requires a viewer. The image demands to be seen; this is how it becomes alive. A new narrative is forged between the image and the viewer. The relationship developed between the image and viewer depends on the interplay and resonance between the image and the viewer’s memories, dreams and experiences.